A capable all-rounder whose brand appeal ultimately outstrips the guitar's performance: not for traditionalists. Yep, lots of letters and numbers: GP is 'Grand Performance', Martin's new, Taylor-like body shape; C means 'cutaway'; PA means 'Performing Artist' series; 5 means the fifth tier (1 being the highest, most expensive); and, finally, K means koa back and sides. "Viewed with traditionalist eyes, it jars worse than John Wayne in a shellsuit. Widen your view, however, and there's no absolute reason why acoustic guitars have to have bound tops"
"We have an interesting paradox: the lighter you play this guitar, the more it sounds like a traditional Martin"
In that respect, a top-end all-solid-wood guitar is often more demanding of your commitment and technique to get the best from it. So we have an interesting paradox: the lighter you play this guitar, the more it sounds like a traditional Martin. Start to dig in with some serious picking/strumming hand force, and the construction and material choices limit the headroom and tonal range. 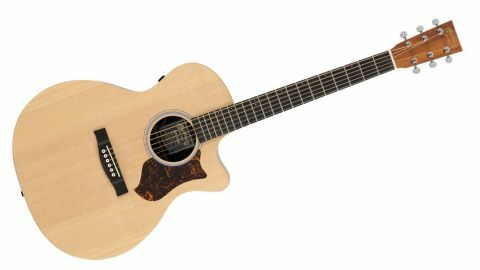 The Grand Performance model (Martin's most recent body shape addition) has more midrange emphasis than in it's sister dreadnought model (reviewed separately). In fact, given the general mid-scoop tendency of the design and materials, that is no bad thing at all. By contrast, the dreadnought sounds somewhat 'hi-fi'; it'd sit well in a layered recording, but you'd have trouble punching out of an acoustic ensemble.